Home · Property Management · Landlord Quick Tips : Q&A: Should I Approve a Good Person with an Eviction Record? Q&A: Should I Approve a Good Person with an Eviction Record? I’ve been looking for a tenant for months and I finally found someone with a reliable income, good references, and no criminal history. However, her credit score is not so great and she has one eviction. She says it’s because she went through a divorce. Should I believe her and accept her as a tenant or is this too risky? Hi Phil, it is crucial that you fill your unit as quickly as possible because you are losing money on it every day it is vacant. It’s good to know your applicant isn’t a dangerous criminal, but you’re right to be concerned about her financial instability. You don’t want to be eviction #2 for this person and unfortunately, one eviction makes it more likely that they will be evicted again. However, there are a few options you can take to minimize your risk when renting. In situations like these, it’s best to use LeaseGuarantee if you want to accept a higher risk tenant. Starting at only $299 for $2,500 of coverage you can protect yourself against damages, legal fees, and potential eviction costs. Either you or tenant can pay for LeaseGuarantee to get coverage up to $10,000. All you need to do is order an AAOA tenant screening package. A LeaseGuarantee Analyzer will automatically be included and will tell you whether your tenant qualifies (in most cases they will). From the report results, you can click to get that tenant covered by LeaseGuarantee. Just as you may be struggling to fill a vacancy, this potential tenant is probably struggling to get approved for a place. They may be willing to pay an extra fee to get qualified or you could reduce their security deposit and have them purchase LeaseGuarantee. Should she leave owing you rent, you can get reimbursed through your LeaseGuarantee coverage. For example, let’s say you accept this tenant and require her to purchase LeaseGuarantee as a condition of getting accepted for the unit. Then 6 months later she starts to fall behind on rent but she doesn’t want to leave. You can follow a normal eviction procedure and file a claim through LeaseGuarantee to get reimbursed for lost rent and legal fees up to the policy amount. So in summary, rent to her, but use LeaseGuarantee to minimize your risk! 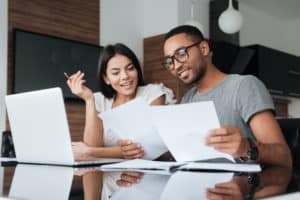 Increasing the number of responsible adults on the lease will make it more likely for you to recover damages or lost rent. If she can’t afford to pay rent, maybe her cosigner, significant other, or family member can. This also helps if you have to file a lawsuit like an eviction because you’ll have more assets to collect from. Also, if you have LeaseGuarantee for this property, then all individuals on the lease are automatically covered. Considering this tenant has a relatively unstable financial background, they may not have the money saved up to pay for 2 or 3 months security deposit. In addition, there are limits in some states as to how much security deposit you can collect up front. The other problem is that a security deposit may not cover more than a month or two worth of lost rent. What if this tenant ends up owing you much more in rent than the security deposit you collected? Although a security deposit helps, getting LeaseGuarantee would boost that coverage even more because with LeaseGuarantee you can get reimbursed up to $10,000 for lost rent, legal fees, and damages. If you have questions about using LeaseGuarantee please call the AAOA team at (866) 579-2262 or visit https://www.american-apartment-owners-association.org/leaseguarantee/ .